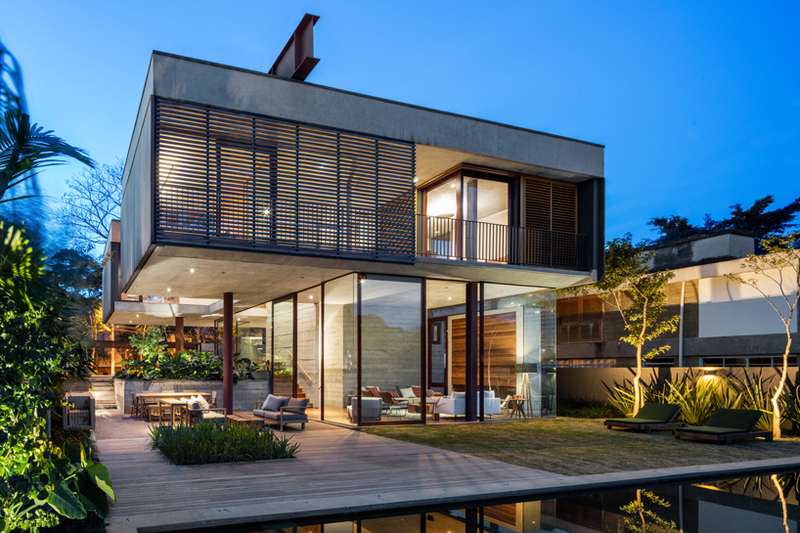 architecture in brazil features a wide range of projects, including intricately crafted residential schemes and bold civic monuments. 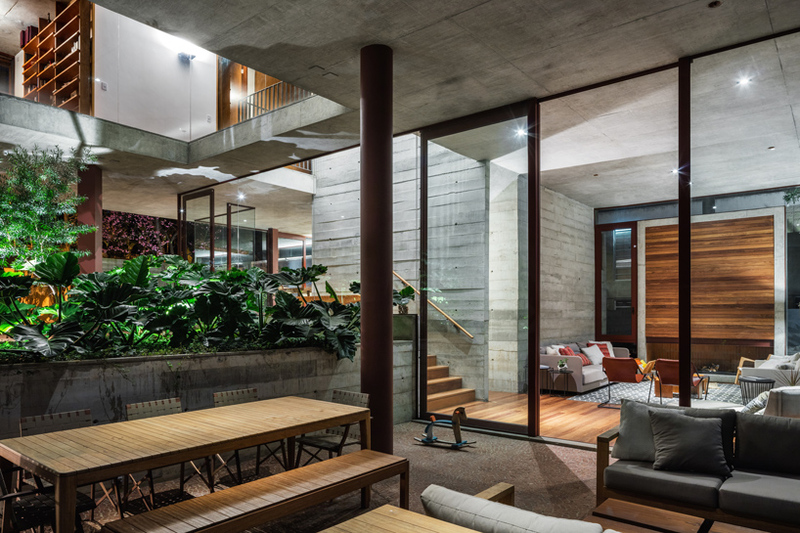 all news related to residential architecture and interiors. 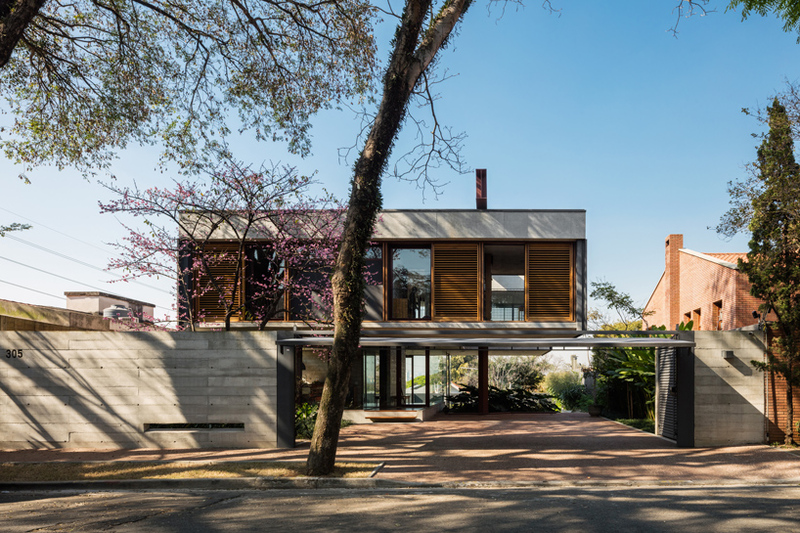 on top of a hill in a residential neighbourhood in são paulo, brazil-based studio una arquitetos sites the villa lobos house. the project seeks to adapt to the geography and to capture the views over the extensive wetlands of ​​the pinheiros river. 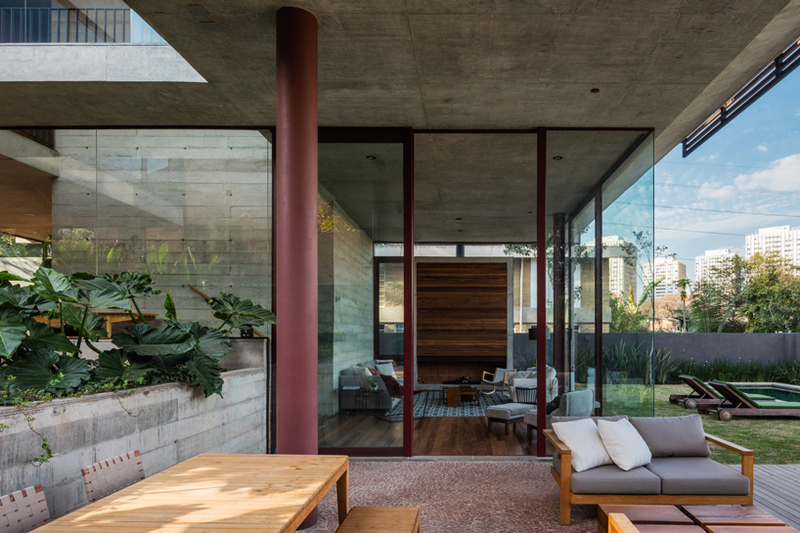 the ground floor of the house follows the smooth slope of the land. 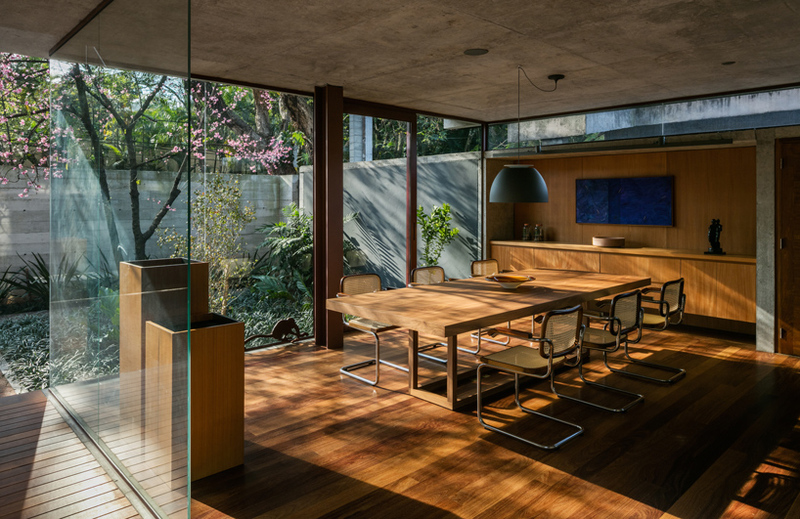 dining room and kitchen form a continuous space and are at a slightly elevated elevation relative to the sidewalk. mid level below is the living room. 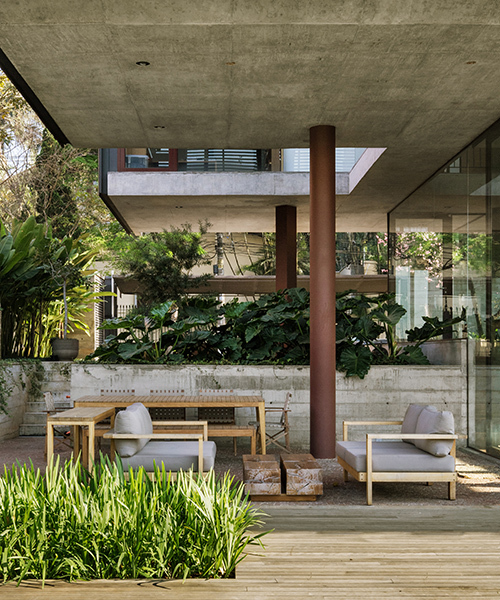 in this movement, veranda and living room gain a double height and maintains a direct relationship with the lower level of the terrain. 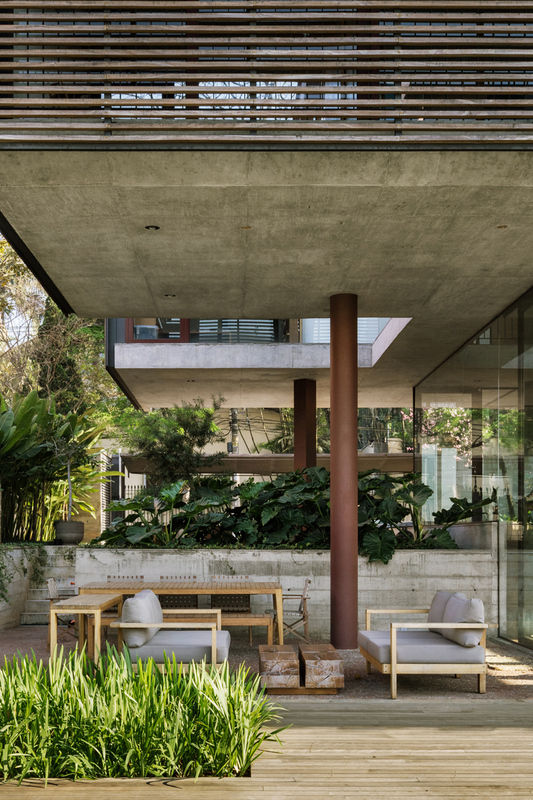 una arquitectos surrounds these programs with three gardens. the entrance garden is marked by a cherry tree already existing on the site. the central garden negotiating between the garage and veranda. the back garden gains the full width of the plot and hosts a swimming pool. 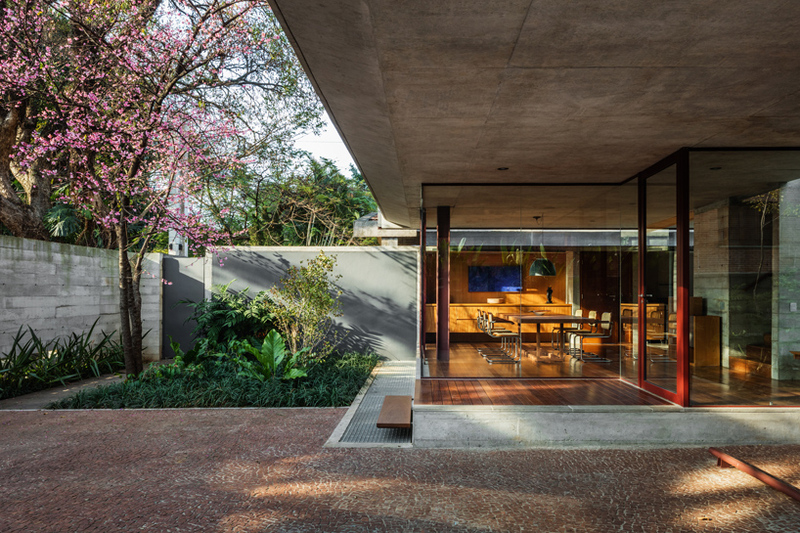 for a better use of the veranda, the support of this entire portion of the house was limited to two metal columns, eccentric in relation to the slabs, and which are connected with a large metal beam over the house. this 16.50m long beam, which runs through the entire volume, hangs the ends of the slabs with metal rods of 32mm in diameter. thus, the volume is suspended on the ground, releasing an extensive view that crosses the whole house. 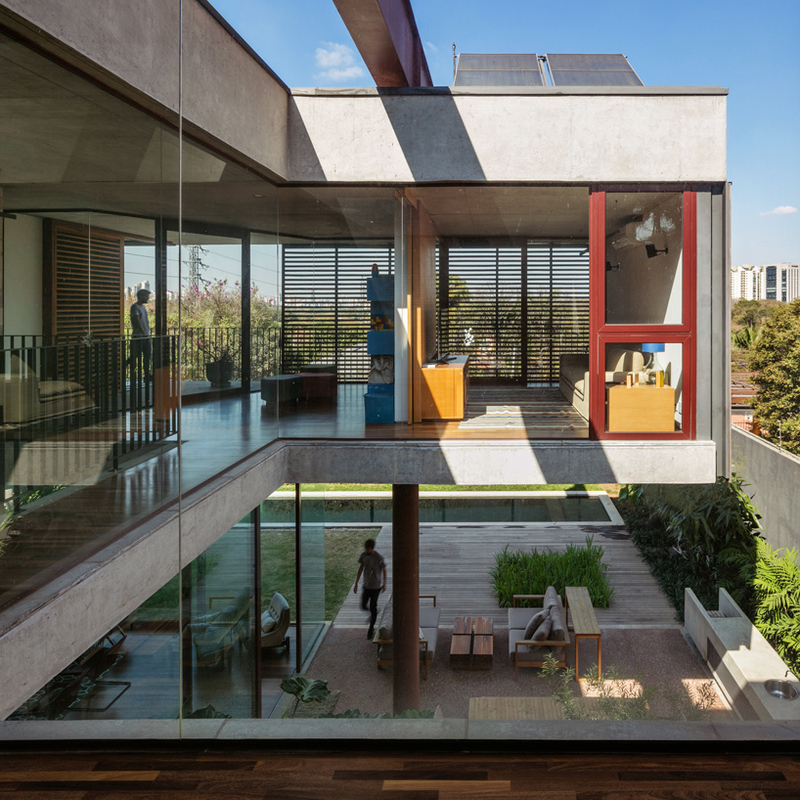 a cutout over the central garden creates an internal void within the volume around which various spaces communicate, from the living room and the veranda from the ground floor to rooms and upstairs studio. the metal columns have distinct geometries and punctuate these spaces on the level of the gardens. 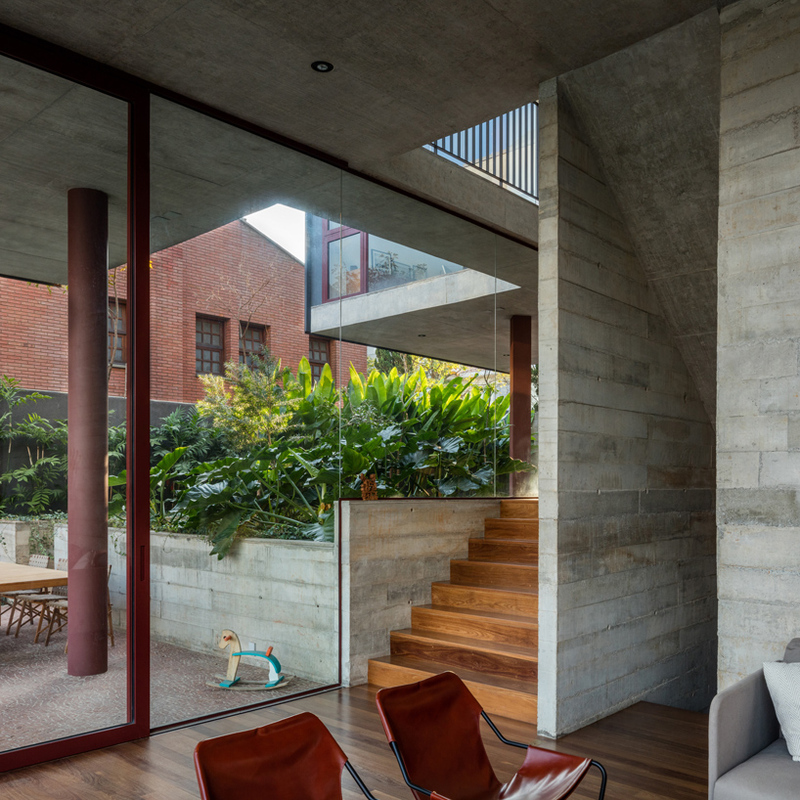 a large concrete block contains the stairs inside it. 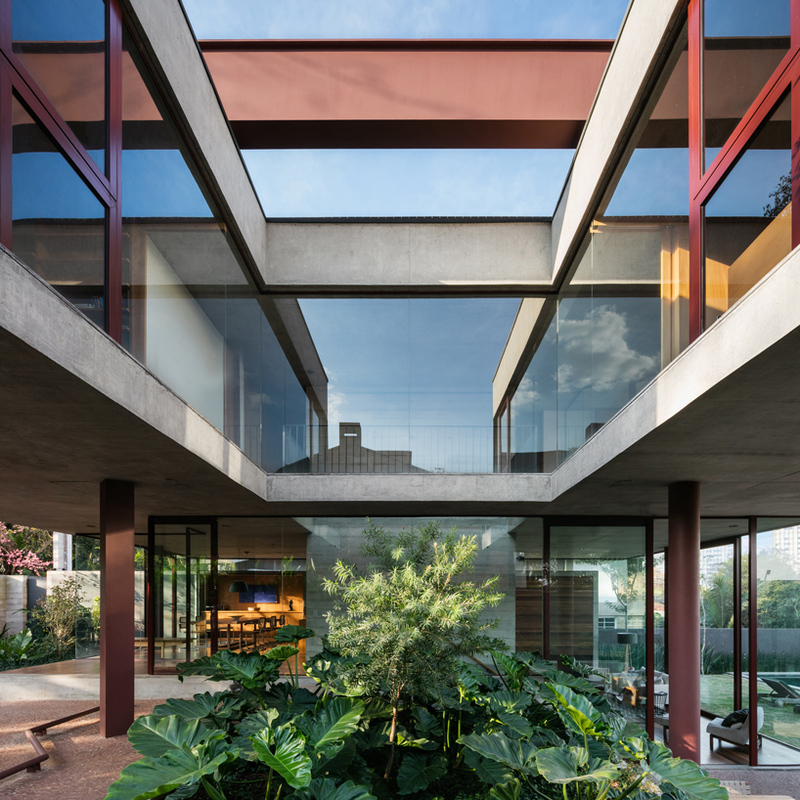 the ascension through this narrow structure enhances the wide landscape that opens on the upper floor, where a veranda and a family room are located. the children’s bedrooms are organized along the northwest face, while the couple’s room faces the opposite side. 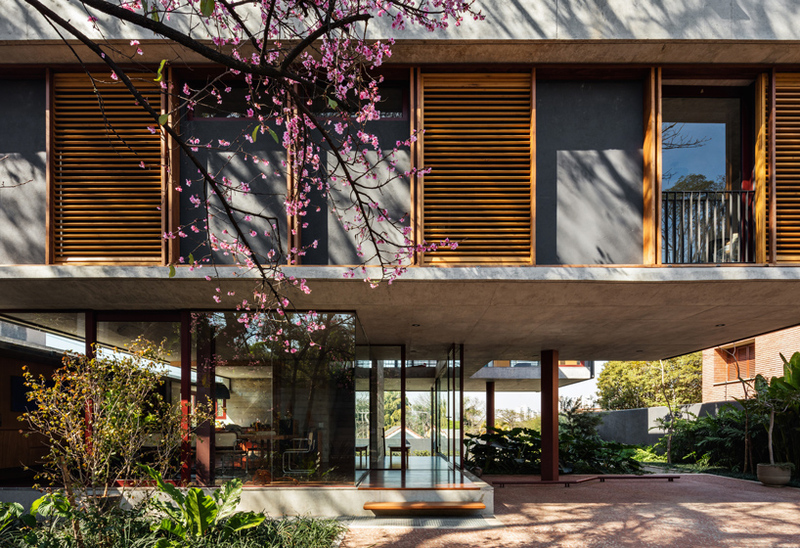 these rooms are protected by the eaves of the roof slab and enclosed with sliding wooden panels with movable shutters. the occupiable roof offers a large wooden terrace with sweeping views across the city.